Whether you're entertaining a crowd, or just want to get dinner on the table with ease, these grain salads are great time savers. Each recipe can be made in about 40 minutes or less, and is easily doubled if you're serving lots of guests. Plus, all of them taste great cool, so you can make them a day or two ahead and store them in the fridge until you need them. (Hello, tasty leftovers!) Another bonus: each of these colorful, dairy-free recipes is vegetarian-friendly, the quinoa and rice dishes are gluten-free, and most feature healthy whole grains. 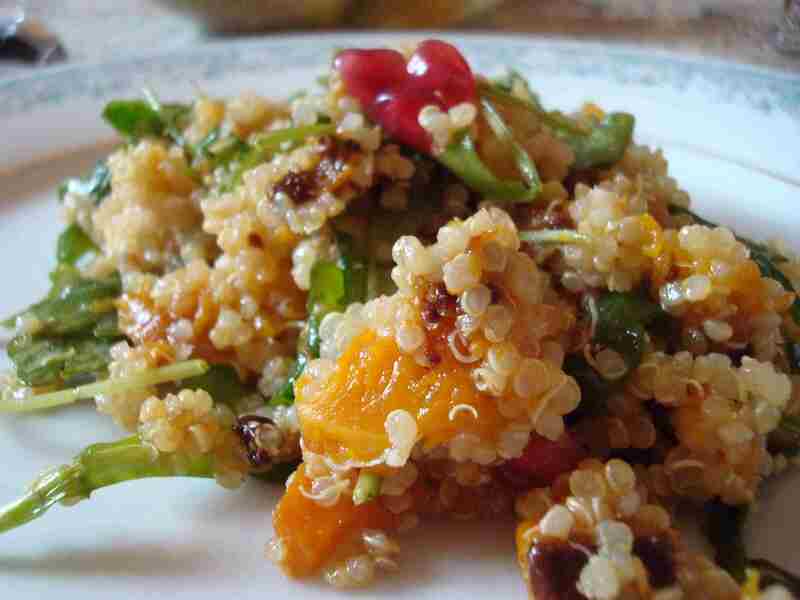 This gorgeous Quinoa Salad with Arugula and Roasted Butternut Squash is so much greater than the sum of its parts. A sprightly, cumin-spiked citrus vinaigrette pulls it all together, while the optional sprinkling of gem-like pomegranate seeds adds a festive touch and little bursts of sweet-tart flavor. If you're a fan of veggie maki, but don't want to fuss with making sushi rolls, this Sushi Rice Salad is for you! Giora Shimoni likes serving it as an appetizer for a summer Shabbat meals, but it's great any time of year, whenever the craving strikes. Serve it as a side dish or base for a rice bowl, topped with fish, meat, or tofu. Healthful and satisfying, this Barley & Roasted Vegetable Salad is incredibly versatile. It pairs beautifully with grilled or roasted meat, poultry or fish, and works with all manner of roasted vegetables, so you can swap in your favorites as the seasonal harvest changes. In her Hip Kosher cookbook, Ronnie Fein writes "Tiny balls of Israeli couscous are the culinary pearls of the pasta world. This recipe combines sweet and piquant flavors in one dish. It’s a treat with grilled meat or poultry, but also can be used as a snack or hors d’oeuvre." Jolinda Hackett combines chickpeas, bell peppers, and crunchy cucumber with couscous, then dresses it all in a Dijon lemon vinaigrette for a perfectly packable salad that can work as a side or one-dish vegan meal. Soba noodles are long, thin Japanese noodles made from buckwheat. Here, they're tossed in a gingery vinaigrette that does double duty as a marinade for the salmon. Since you can prepare the salad while the fish is cooking, the whole recipe comes together in under 30 minutes -- great for busy nights when you still want a special meal. P.S. If you don't eat fish, the soba salad is great on its own! Katie Workman combines freekeh -- or roasted green wheat -- with savory mushrooms and broccoli rabe in a picnic-worthy salad that's equally well suited to fall and winter meals. Farro is a catch-all term that refers to emmer, spelt, and einkorn, three ancient species of wheat. Whatever variety you find, farro is a delicious whole grain with a satisfyingly chewy texture that makes a great base for salads. Here it's tossed with roasted cauliflower and spiced chickpeas and dressed simply in lemon and olive oil; if you'd like, toss in some roasted red peppers or grape tomatoes for a punch of color and flavor. You can emphasize the bulgur wheat, or go super heavy on the parsley in Molly Watson's take on the Classic Tabbouleh Salad, tossed with a garlic mint dressing. Either way, it makes a great side for grilled meat, chicken, or fish, or a base for vegetarian bowls with chickpeas or white beans and feta.